I posted a log with the intent to award a favourite, but forgot to tick the heart before submitting the log. I then went back to the cache page and clicked on Favourites - Add Favourite. However, instead of adding my favourite to the cache, I ended up on a list of all caches I had given favourites previously. You didn't see this pulldown list when you clicked on the Favorites box at the top of the Listing page? If not, it might be something peculiar to the specific page you were looking at. I would try it a few other Listing pages, and if they all behaved in the same manner, contact HQ, as it might be something unique to your User account. Was the log you posted definitely a "Found" log, so you have the smiley face on the cache page now? We had a similar query months ago and it turned out the cacher in question had posted a "Write Note" and not a "Found" log. instead of adding my favourite to the cache, I ended up on a list of all caches I had given favourites previously. I've seen this too, the last few days. I'd assumed I just fat-fingered the wrong hot-spot (Firefox on Android), but on poking around, I don't see a logical spot where that should happen. Groundspeak, I think you need to fix both issues. I haven't seen the behaviour described in this thread, but it's been a while since I awarded a favorite. I'm mostly using "old" logging from site. FWIW, I just tried it and got the same result. I've definitely logged a find on the cache and haven't already awarded a FP. 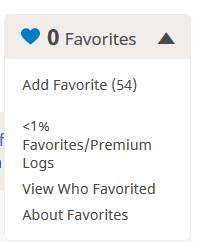 When I click the FP drop-down and click "Add Favorite", it takes me to https://www.geocaching.com/my/favorites.aspx and the cache isn't added to the list. I get the same result in IE, Firefox, and Chrome on two different computers, so this appears to be a server-side issue. I awarded FPs to 2 caches I found yesterday, after logging. It worked as expected. Did you do it just now, or yesterday? I just tried adding a FP for the same cache I was trying earlier, and this time it worked as expected. Either something just got fixed or it's an intermittent issue.